On March 15th Miss Quin spoke Irish for most of the day. We tried to speak Irish as much as we could. After we had written the recipe in Irish we made and decorated buns. We went to the shop and had to calculate the cost of the ingredients in Irish too. 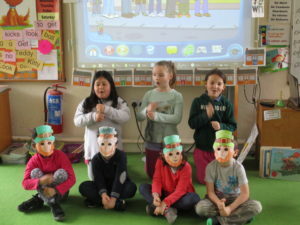 We did some dancing and a quiz in Irish too. 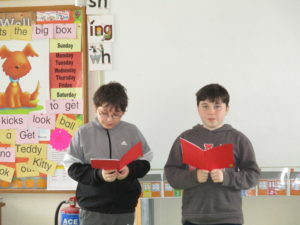 We also wrote some Irish books which we presented to the Junior Room. Liosmór Mochuda National School is a mixed two-teacher school in Lismore, Co. Waterford under the Patronage of the Church of Ireland. It is nestled at the top of North Mall between the historic St. Carthages Cathedral and the Deanery.